The needle threader by Dritz is the best tool to assist you in threading your needlepoint tapestry needle. The threader package comes with 2 needle threaders. Place one end of the threader through the eye of your needle. Then place the fiber you're stitching with in the threader hole. Once in, pull the threader out of the needle. 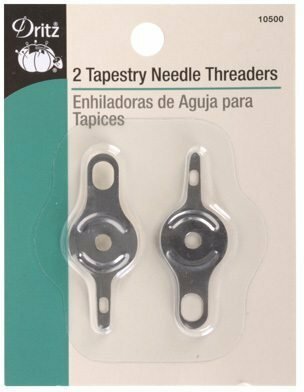 Needle threaders are in stock and can ship within one week.